What happens when you control Scalextric with your mind? What happens when you control a Scalextric car with your mind? A brain–computer interface is a communication link between a brain and an external device. 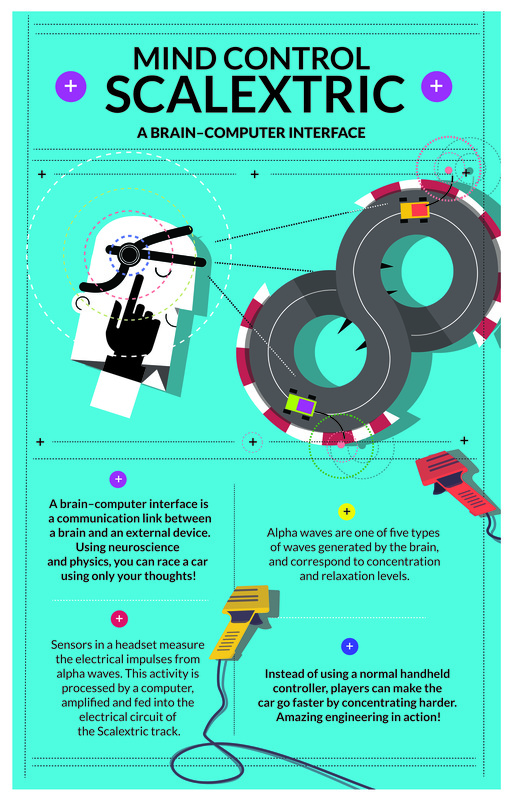 Using neuroscience and physics, you can race a car using only your thoughts! Alpha waves are one of five types of waves generated by the brain, and correspond to concentration and relaxation levels. Sensors in a headset measure the electrical impulses from alpha waves in the brain. This activity is processed by a computer, amplified and fed into the electrical circuit of the Scalextric track. Instead of using the handheld controller, you can make the cars go faster by concentrating harder. Would you be able to relax your mind and concentrate at the same time? Mind-controlled Scalextric is brought to you by Warwick's Biomedical Engineering Outreach Team; a group of five 4th year Masters Engineering students of multiple disciplines, supervised by Professor Christopher James.